Two Danish soldiers serving in the German military in 1916 during World War I are stranded in a bomb shelter on the Western Front. I had the distinct privilege of seeing David Adler’s powerful animated film Sort, otherwise known as No Man’s Land, at the 2014 Telluride Film Festival. 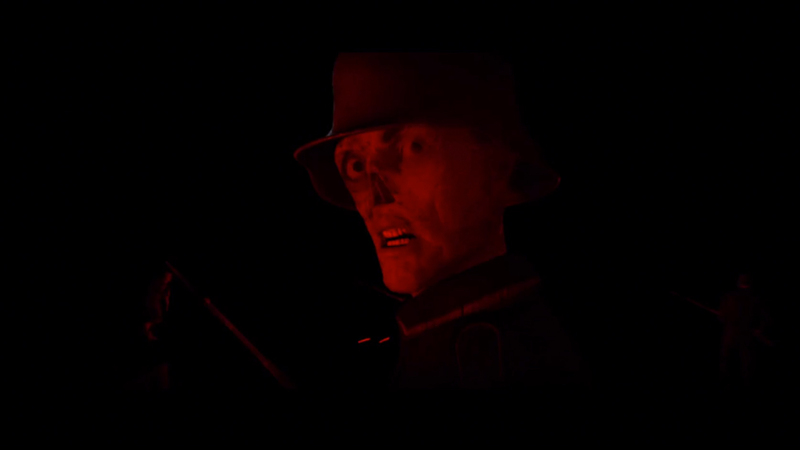 The film surrounds two Danish soldiers, one of which has deformed and burnt face, serving the German military in 1916 stranded in a bomb shelter on the Western Front. While the two struggle to survive constant enemy attack from the outside they have their own struggles within the shelter to overcome as well. The opening sequence provides one of the most cinematic experiences I’ve ever come across in animation and to some extent in all of short films. When we saw this in the theater all we could see is the distinct red flashes of silhouettes. The effect is powerful and chilling I highly recommend, if you can, watching Sort in a completely dark room to get the full effect of the opening sequence. Sort is wonderfully unusual and unlike any other I’ve encountered at any festival. Not only is the film narratively unique and captivating but is visually unique as well. While the film is certainly not traditionally pretty there is an undeniable beauty to it. The aesthetic is a perfect mix of realism and imagination, filled with rich and peculiar textures. The question of ‘how did he do it’ came up quite a bit at the festival. The film was animated in 3ds Max and the motion capture was done in Motionbuilder. While I understand many of the people attending the festival were not animators I was still surprised and in some ways glad to hear how many people were uncertain as to whether or not the film was stop-motion or CG. The aesthetic carries a certain tactility that could certainly fool the eye. As animators, one of the discussions that often comes up is that of the necessity of the form. That is, some believe animated films should maximize the potential of the animated form, and more specifically only make films that demonstrate what animation is truly capable of (such as morphing, squashing, stretching) and visually expressing what would be impossible in live-action. In short, they believe that if it could be made in live-action, don’t animate it. While this film certainly could have been carried out in live-action, I don’t think it would have had the same impact or captivated the audience as much as it does in its animated form. Sort is a perfect example of how the animated form, when used to emulate a live-action experience, can potentially enhance and transform the narrative into something even more meaningful.